Heh, sweet cake. Can't wait for the details. Wow that is a great cake? Who created it? I'd like to see the rest of their creations. 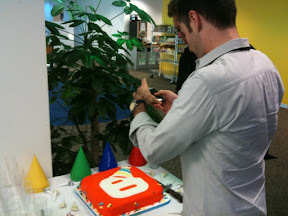 Happy Birthday, Blogger! Awesome cake. It looks yummy. Rick, how do I reach you by email to ask you about ftp publishing on blogger, going forward. @Anonymous: In general, my blog isn't a great option (nor is direct e-mail) for Blogger support. A much better option is our help forum (http://help.blogger.com/) or Twitter (@Blogger).